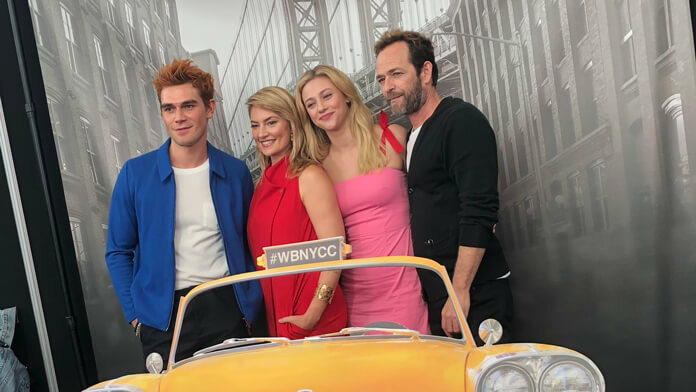 Lili Reinhart joined her Riverdale co-stars KJ Apa, Madchen Amick, and Luke Perry, as well as series creator Roberto Aguirre-Sacasa, for a panel on the show’s third season at the 2018 New York Comic Con. Reinhart also took part in roundtable interviews in which she discussed Betty’s relationships in the upcoming season three. The CW will kick off Riverdale season three on Wednesday, October 10, 2018 at 8pm ET/PT. I love when Betty goes dark. Are we going to see much more of that in season three? Lili Reinhart: “Yes. I’m having flashes in my head of what we’ve shot so far. You definitely see…I don’t like to think of her as ‘dark.’ I just like to think of her as really strong and like badass. She’s always strong, but you do see her dark – not evil – but I guess dark – I like to use the word badass – side come out. She’s feisty and she’s a fighter. You do see that a lot. Betty gets put through a lot this season already and you would think that things would be easier, given season two. Maybe she’d have a break. Things couldn’t get worse. But somehow they do, but she navigates her way out of it. What can you say about the relationship between Betty and Polly? Lili Reinhart: “Betty and Polly, you haven’t really seen a loving, sisterly relationship from them and you’re not going to. I think that ship has sailed. I think that Polly is brainwashed from the cult farm that she’s in. Betty thinks it’s a cult but they say otherwise, Alice and Polly. But I think Polly’s far gone. I think that she’s quite self-righteous and thinks that Betty’s on the wrong path, needs to bring her to the good side. ‘Join the farm. Everything’s great here.’ It’s like this oasis, but Betty looks at it as a cult that brainwashes you. Since there’s so much turmoil in Betty’s life, is it safe to say she and Jughead will be stable this season? Lili Reinhart: “I mean, all of the core four are dealing with their own sh*t, basically. They’re each dealing with something so intense on their own, so you know it does test them when they each have something so intense going on in their lives. Obviously, that is going to cause some distress. How much of yourself do you bring into the role? Lili Reinhart: “I mean, I see such a clear difference between myself and Betty. It’s hard to explain fully. But, it’s like playing a nicer, more badass, more put together version of myself, basically is what Betty is. Also, my dad’s not a serial killer which is good. And, also, I have a great relationship with my family and Betty is always at odds with hers which is sad.